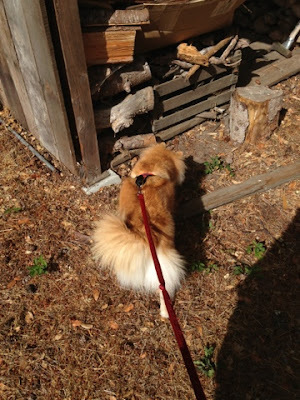 A few weeks ago, Maya and I journeyed into the deep mountains of Santa Cruz for a semi-private TTouch class. 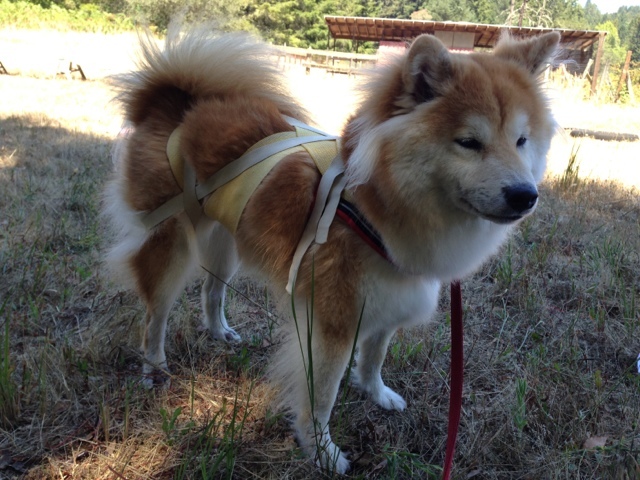 It was recommended by K, the Jindo owner. I was hoping the class can teach me methods to calm Maya down when she's itchy, as well as help ease her up when meeting dogs on leash. The drive over wasn't very pleasant, especially after getting lost in the woods by following my GPS. Lucky, my classmate made the same mistake and we both ended up at the same place; even luckier, I still had cell reception in the middle of nowhere. Half an hour later, Google Map led us around a whole mountain to where we should be. I felt like puking upon arrival, but somehow Maya was totally fine. The class took place outdoors on some wild grasses. 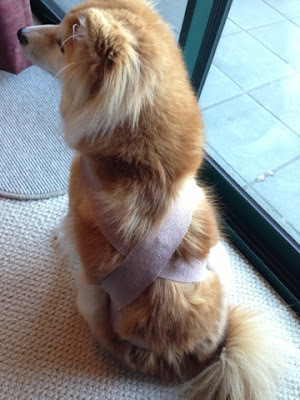 We learned a few massage techniques, how to wrap the dog up with bandages, and how to read their body languages. Maya was never a cuddly girl, so the massage were ok. She would tolerate for a while, but would eventually run away. I was afraid I'd forget the "moves", so asked Maya's daddy to film them once I got home. I do like the wrapping, because it's kind of like a thrundershirt that helps calm the dog down, but much better suited for the hot weather. Maya, of course hated it. The first few times I put it on, she was panting so heavily, I was worried that it's stressing her out even more. After a few days, she seems to be getting used to it, but still spends a good 5 mins pacing and panting every time it's on. I do notice that once she calms down, she does seem scratch or lick much less. Overall it was an interesting class at an interesting location. I went to the class without much knowledge of TTouch or what to expect. Somehow I was hoping for a little more, but not quite sure what was missing.